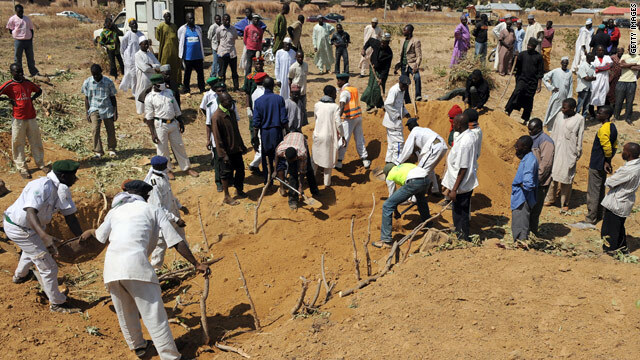 Workers on Saturday close mass graves where dozens of people killed during religious clashes were buried. 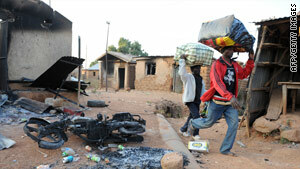 Nigerians flee the city of Kuru Karama on Thursday after religious violence reportedly killed 150 Muslims. "Yes [the clashes] occurred, but I cannot confirm any numbers," he told CNN. "At this time the government is still compiling figures of those people affected and of those displaced in Jos. They are accounting for the deceased and missing. At this time I cannot confirm the number of dead." Earlier this week, dozens were reportedly killed in clashes in Jos. Angulu did not specifically address the reports about Kuru Karama. On Thursday, Jonathan declared in a televised address that the attackers in the state of Plateau would be held accountable, according to Human Rights Watch. Police were called to end the attacks, but they did not, the group reported witnesses as saying. Hundreds have died in clashes between Christians and Muslims in central Plateau state in the past decade. With more than 78 million Muslims, it has the sixth largest Islamic population in the world, according to a study last year by the Pew Forum on Religion and Public Life. A curfew was imposed Tuesday -- the same day as the reported attack in Kuru Karama -- in Jos after violence flared up there following unrest on Sunday. A local activist said 69 people had been killed and about 600 injured in the most recent outbreak. Thousands more were displaced, seeking shelter in military and police headquarters, said Sani Shehu of the Civil Rights Congress in Jos. There was no independent confirmation of Shehu's figures. It is unclear what sparked the latest violence.